6500 Watt Generator with CO Shutdown Sensor is rated 4.8 out of 5 by 57. Rated 5 out of 5 by Chrisatggo from perfect fit I needed this as a backup for a farm to keep things going if the power go's out during the recent hurricanes and it was super easy to assemble (less than 10 minutes) once assembled it is really easy to move around by myself. And it started with only 3x pulls on the starter cord the first start and one pull after. This is a pretty good sized generator so its not exactly Quiet but I needed the higher kw output to run 210v well several refrigerators fans and lights and a small quite one was not going to do it all. This will. It also has a nice meter that tells voltage, hours, mhtz, and kw, . It ran everything I needed it to and can run more. Rated 5 out of 5 by Jodayle from Survivor mode!!! Come on, guys. No matter how tough you pretend to be-if you look long enough into the darkness you will feel the hair on the back of your neck and your arms rise with the sudden fear of not being able to see what may be out there. I am surrounded by 22 acres of forest-and believe me when I say this generator keeps the monsters away and the heat in when I need it. Easy to hook up-easy to fill and start and easy way to give you peace of mind. No problems what-so-ever, and it's well worth the more than fair price. Don't just survive-be sure you survive. This product is a guarantee you will. Rated 5 out of 5 by MJMRANCH from update from first review with issues purchased this generator for the hurricane, it started on first pull but there was an issue with power output. Had to bring it to service center and there was a wire that shook loose in transit that once reconnected put everything back into working order and it passed all the load tests with flying colors. brought it home and tested it out on my own, still started on first pull, connected it to my deep freezer and ran it for a few hours so it put a drain on the generator and it never bogged down or showed any strains to keep up. Very happy with my purchase and now i am ready for the next storm! Rated 5 out of 5 by Archie Bunker from Set Up & Initial Check Out I purchased this before the Sept 2018 Hurricane to be prepared. Of course, the predicted rains and power outages did not hit our area, so the unit remained in the box for about 4 months. Tonight is supposed to be a 12-18" snow storm, followed by rain and a melt to ice, so I finally de-boxed the unit, accomplished the minor assembly, added the provided oil, a gallon of gas, and three pulls later, it started fine. I idled it for 20m, shut it down and wheeled it into the garage for storage. I've got another brand, very similar in features and operation, this unit seems comparable and acceptable. Rated 5 out of 5 by jgarret1 from Saved us after Hurricane Michael I did not expect to be buying a generator in mid October as a result of a brush with a Hurricane, but thats what happened when Michael hit. after losing power at 11PM the first thing I did the next morning was call several big box stores for a generator and Home Depot had just recieved some in. I was grateful to find a brand name unit at a decent price (any price would have been ok at this point) I got the unit home, put oil in, fueled it and started it right up. Its basically running my entire home and doing a fabulous job. My ederly mother lives with us and besides needing the obvious basic's like refridgerator and phone, my mom has a pacemaker and is connected to her cardiologists thru a unit called a "Merlin" heart monitor. The device transmits her data via phone line so power.....is essential. The Ryobi 6500 has saved the day and I couldnt be happier.......so is Mom!! Rated 5 out of 5 by Pam123 from Generator I just bought this today and we put it together and it is so beautiful. It cranked right up with the first pull. We have Hurricane Florence coming out way and I know it is going to work so great for us. I would tell anyone to buy this product. We are both very happy that we made this purchase. I feel a whole lot better with the storm coming now that I have this nice generator. Rated 5 out of 5 by Steve M from Runs like a champ!!! I bought this a little over a month ago, right after Hurricane Michael. Started right up and worked great. Luckily for us, we got power back within a few days. But when I went to help an old Navy vet friend of mine, he did not have power and they had a old generator barely running. We hooked up my new Ryobi generator and it ran non stop for about 5 weeks. It never slowed down and we were able to hook it up directly to his house, with the help of an electrician. It ran everything in their house except the main A/C, but they had a portable A/C for their room that worked. This generator made life a lot easier for my friend and his wife. They went 6 weeks without power and thanks to the quality of this generator, they had power, water (well pump) and A/C. It's super easy to start. Rated 5 out of 5 by Dave Crews from The best portable/home generator! Get one now, for this price it’s totally worth being comfortable if you are in an area that gets hurricane weather or ice storms. Very happy with this generator, assembly was super simple, everything but gas was provided in the box to get it running! Put gas in, barely pulled the start chord and it cranked right up!!! Tons of power and electrical capacity! 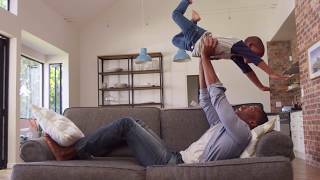 I can run my refrigerator and my AC unit at the same time! Added some fuel stabilizer to the gas jug before filling up the generator, should be good for a while. The owners manual has all the scheduled hourly, and storage maintenance requirements, and the hour meter tells you when it’s time. Very reasonable price, can ask for anything better. Added it to my RYOBI account for warranty and parts ordering, super simple process. 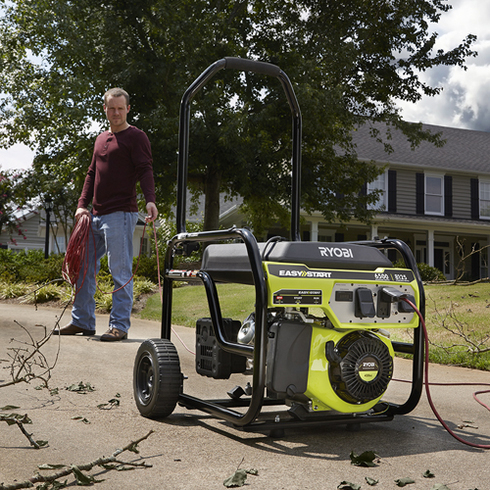 The RYOBI 6,500-Watt Portable Generator is the perfect power solution at home or on the jobsite. This generator delivers 6,500 Running Watts and 8,125 Starting Watts of power. A durable wrap-around hand truck frame and 10 in. wheels help protect the unit while making it easy to transport. An Automatic Voltage Regulator ensures reliable and consistent power while preventing damage to the generator and the devices plugged into it. The easy-access control panel has four 120-Volt 20 Amp (GFCI Protected) outlets and one 240-Volt 30 Amp Twist Lock Outlet to meet all your power needs. 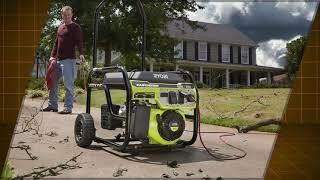 All backed by a RYOBI 3-Year Limited Warranty, this RYOBI Portable Generator is guaranteed to perform.